Description: This print in shades of navy, white and blue reminds us of the lovely sari fabrics. 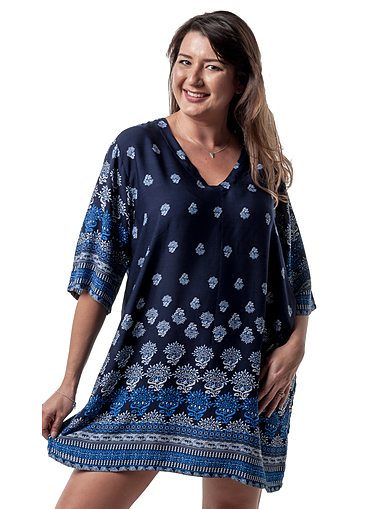 Gorgeous feminine kaftan in lightweight rayon perfect for hot summer days. The V neck is flattering for a full bust and the 3/4 loose fitting sleeve hides the upper arms. Great to wear over swimwear or nice enough to wear out at night for a beachside dinner. Care Instructions: Cool hand wash and drip dry. Can be machine washed on a gentle cycle.